A group of MPs is calling for an independent fuel price watchdog - to be called Pumpwatch - to monitor the cost of petrol and diesel. Petrol stations that charge fair prices would be entitled to display a "kitemark" logo. The All-Party Parliamentary Group (APPG) for Fair Fuel is accusing the industry of increasing its profit margins at the expense of motorists. But petrol retailers said the idea of a watchdog was "pretty impracticable". The plan to set up Pumpwatch follows a petition organised by pressure group FairFuel UK. It has collected 14,000 signatures since the week before Christmas. Why do fuel prices vary so much? The MPs said that petrol retailers made an average profit of 8p a litre in the first nine months of 2018, but this had increased to more than 13p a litre by the end of the year. The margin on diesel prices had risen from 8.6p a litre to 11p a litre, they said. The average price of unleaded petrol is currently 120.92p a litre, according to Catalyst Experian, with 65% of the price accounted for by fuel duty and VAT. "Drivers need reassurance that they are not paying way over the odds for fuel," said Kirstene Hair, the chair of the APPG. "In rural communities where public transport is poor and unreliable, people need their vehicles to get from A to B. It is essential that they pay the fairest price. That is where a price monitoring system would support them." Fuel price campaigners argue that, even though pump prices have fallen over the last six months, they have not fallen as fast as wholesale costs. In other words, they remain too high. But the industry firmly rejected the plan for a price watchdog. 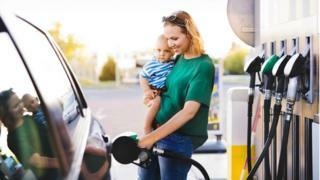 "While it is possibly a well-meaning idea, it would be pretty impracticable," said Brian Madderson, chairman of the Petrol Retailers Association. "Who is going to check prices at 8,500 forecourts? And if you have a kitemark, what's going to be the acceptable margin?" He said that low-volume petrol stations in rural areas needed a much higher profit margin than high-volume outlets. "If people don't like high prices, they can go to a cheaper forecourt," he added. The RAC agreed that retailers had been increasing their profitability. "Retailers have been taking greater margins than they would normally do, and that's caused prices to be higher than they should be," said Simon Williams, the RAC's fuel spokesman.